King Felipe VI has come under fire after attending a bullfight amid increasing calls to ban the ‘bloodthirsty’ sport. The Spanish monarch was guest of honour in a rare appearance at the San Isidro Fair in Madrid over the weekend, but animal campaigners have denounced the annual event as ‘animal abuse’. 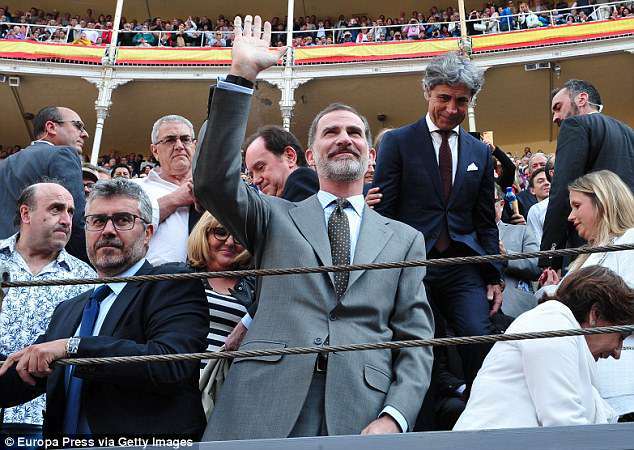 Felipe, appearing without his wife Letizia, watched matadors Manuel Escribano, Paco Ureña and Emilio de Justo take on bulls at the Corrida de la Prensa, a highlight of the bullfighting calendar, on Sunday. But many expressed disappointment at his decision to visit the Las Ventas bullring, with one Twitter user calling the sport ‘bloody and bloodthirsty’. One wrote: ‘It sickens me that the Spanish King supports this terrible sport’. It was his first appearance at the event, which is traditionally attended by the reigning monarch, after royal engagements prevented him from attending in 2016 and 2017, according to Royal Central. But unlike his father, former King Juan Carlos I, 50-year-old Felipe is not believed to be a fan of the sport. Felipe and Letizia attended a bullfight in 2008, as is customary before a royal wedding, and the king returned in 2015, a year after taking the throne. Felipe’s appearance this weekend comes amid increasing calls for bullfighting to be banned in the country that invented it. His father King Juan Carlos, who abdicated in 2014, once described the blood sport as a ‘Spanish asset that we have to support’. Three years ago, the former monarch was spotted at another festival in San Sebastian where he told reports it was ‘thrilling’ to share the experience with his daughter and grandchildren ‘who have always supported the national fiesta’. In 2010, the Catalan government voted to ban deadly bullfighting in the northeast region but in 2016 Spain’s top court overturned that decision, judging that it was part of Spain’s cultural heritage. The bullfighting tradition has drawn increasing controversy and protests around Spain in recent years, with demonstrators turning up and taking to Twitter to denounce what they feel is a brutal, anachronistic event. According to AnimaNaturalis, more than 60 bulls were ‘tortured’ over the space of a week during the Fallas de Valencia festival earlier this year. And in March, thousands of protesters gathered in the city to protest the tradition. Bullfighting also has a long and gruesome history of human casualties; it is estimated that more than 530 professional matadors have died as a result of injuries received in the ring in the past 300 years.